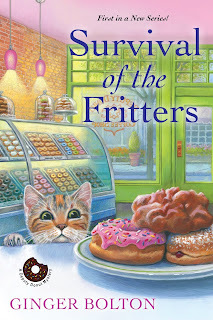 by Dep the cat from Ginger Bolton's Deputy Donut Mysteries. For obvious reasons, I don't care for the word sidekick, especially when many amateur sleuths are owned by cats or live with dogs. I mean really, sidekick? 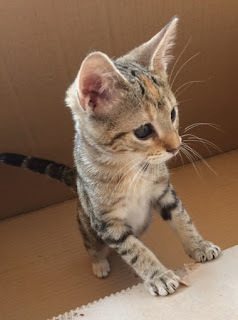 I'm the tortoiseshell tabby (torbie) who supervises the office at Deputy Donut (named after me! ), the famous donut and coffee shop in Fallingbrook, Wisconsin. I help my person, Emily Westhill, with just about everything, so although she gets some credit (which she doesn't really want) for solving murders, I am always in the background doing little things for her. For instance, if someone I don't trust comes into Deputy Donut, I see them through the window from my office, and I make myself big to intimidate them. If I find something odd in our garden, I make certain that Emily knows about it. I even tried to get someone to rescue Emily once (she got out of the predicament herself.) I do all of this with elegance, finesse, and calm contemplation. I mean, just look at me! 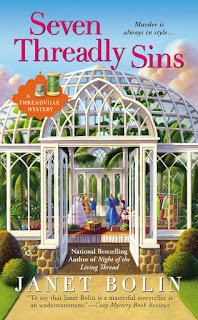 Apparently, Emily and I have someone called an author, Ginger Bolton, who tells our story. Ginger has another name, Janet Bolin. 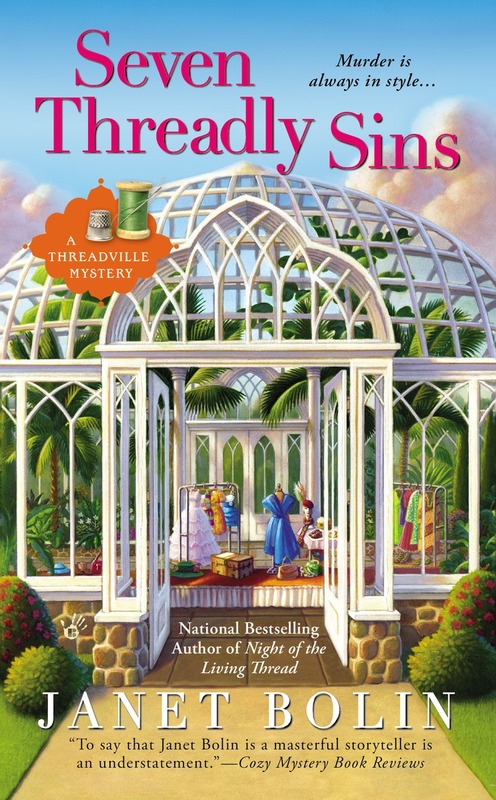 In the Threadville Mysteries, Janet tells stories about a couple of dogs, Tally-Ho and Sally-Forth, who supposedly help their person, Willow Vanderling, sniff out clues and solve murders. I'm sure that the enthusiasm of Tally-Ho and Sally-Forth can come in handy sometimes. But look at them! Do they look like they solve mysteries with elegance, finesse, and calm contemplation? Or do they look noisy and rowdy? 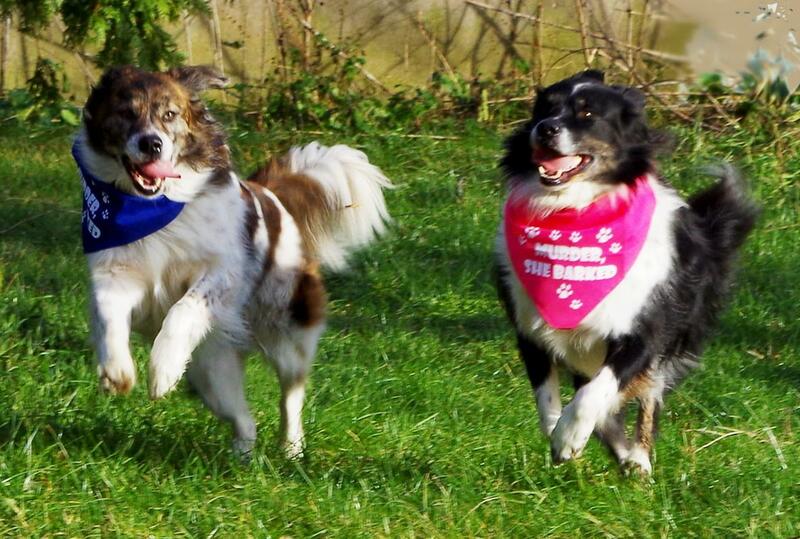 What's the point of sniffing out clues if flailing about scatters the evidence? Their feline helpers have probably given up trying to corral them. Their adventures are available at these booksellers. 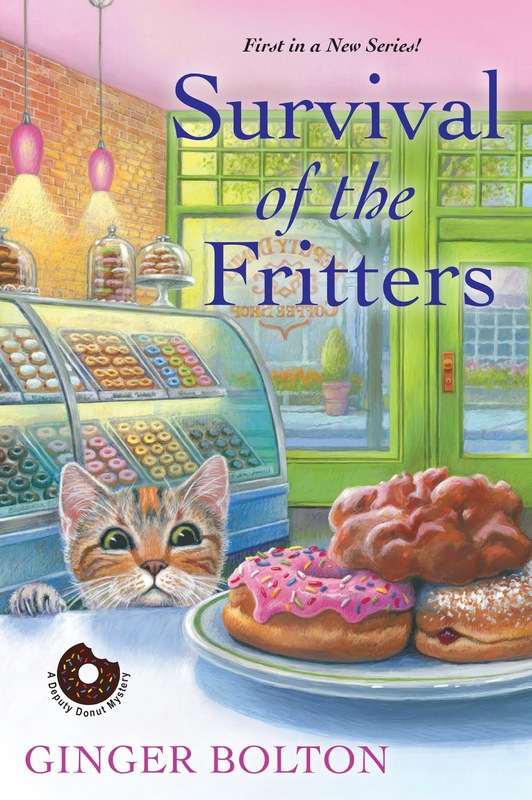 You can read about my finesse, elegance, and calm contemplation in Survival of the Fritters, available in stores and libraries now. 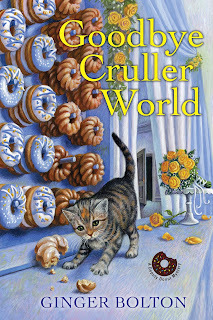 Goodbye Cruller World comes out August 28, and is available for pre-order. So...what do you think? Sidecat or sidedog? Sally-Forth, Tally-Ho, Mustache, and Bowtie like your answer. Dep is staring with her eyes slightly crossed. I'm also going with both. Dep seems to be in a bit of a snit. I would normally say Dog. 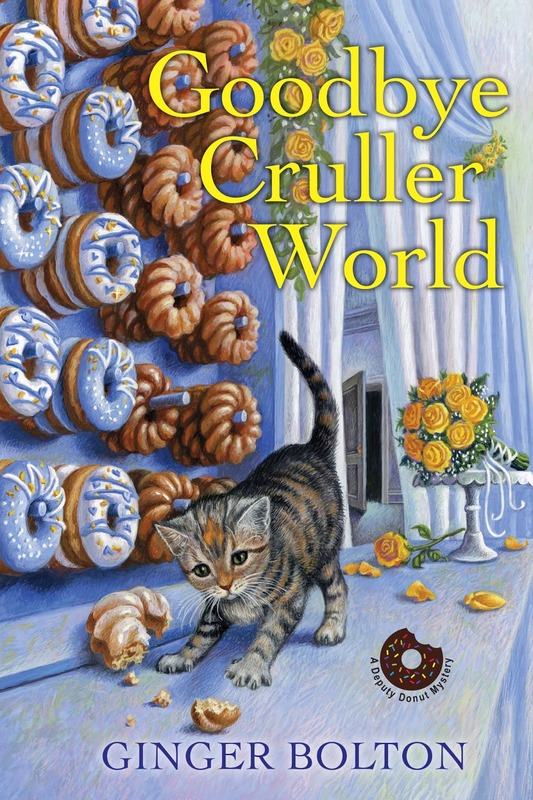 Yet when I read I kind of feel better when the protagonist has a cat. Dogs cannot be left at home/work so much. Cats can be more independent. Dep agrees with you! She is very proud of going to work each day with her person.